In 1829, London's first bus service trundled out of Paddington bound for the City. Since those first pioneering vehicles of George Shillibeer, the London omnibus has ditched horses for engines, turned red, grown an upper deck, carried troops to the trenches and Young Ones to their doom, bendified, de-bendified, moved through dozens of designs, paraded at the Olympics and, ultimately, become a worldwide symbol of our city. The story of the London bus is both epic and nuanced. This new book from London Transport Museum satisfies both requirements. It's a visual delight, with images rammed tighter than a Number 25 in the rush hour. Bus obsessives have plenty to ogle, with more than enough photographs charting the evolution of the vehicle. Those with a more casual appetite for transport history will also enjoy the many insights into how the bus coped with, and sometimes helped precipitate, changes in society. It's a multi-author book, including the talents of ubiquitous transport expert Oliver Green and London Transport Museum's long-serving director Sam Mullins. Despite the numerous voices, the meat of the book holds together extremely well. The start and end are less successful. The introduction feels somewhat inchoate, sliding around like a double-decker on a glacier of grease. The final chapter, meanwhile, is too cursory on the significant changes of the past decade. Nevertheless, this is a stonking tome, beautifully designed and edited, that will appeal both to everyday passengers and vehicular connoisseurs. Superb front cover, too. 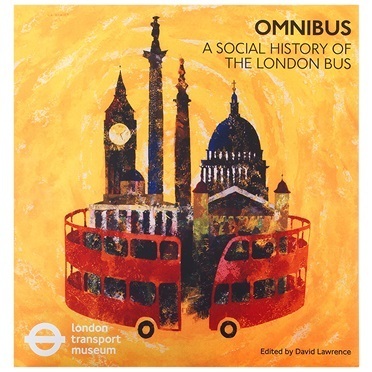 Omnibus: A Social History of the London Bus is out now from London Transport Museum. Looking for other books about London? See our book review archive.